I. Neath, G.D.A. 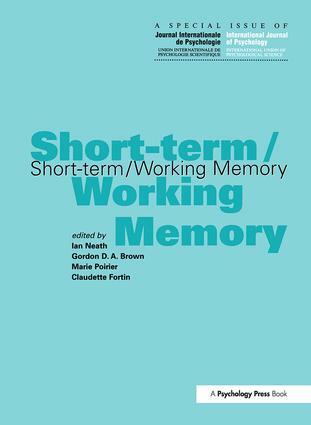 Brown, M. Poirier, C. Fortin, Short-term/Working Memory: An Overview. B.A. Dosher, Item Interferece and Time Delays in Working Memory: Immediate Serial Recall. G.A. Tolan, G. Tehan, Determinants of Short-term Forgetting: Decay, Retroactive Interference or Proactive Interference? V. Coltheart, Comparing Short-term Memory and Memory for Rapidly Presented Visual Stimuli. A.B. Fallon, K. Groves, G. Tehan, Phonological Similarity and Trace Degradation in the Serial Recall Task: When CAT Helps RAT, but not MAN. C. Fortin, Short-term Memory in Time Interval Production. N. Merat, J.A. Groeger, D.J. Withington, Localizing Localization: The Role of Working Memory in Auditory Localization. W. Macken, S. Tremblay, D. Aldord, D. Jones, Attentional Selectivity in Short-term Memory: Similarity of Process, not not Similarity of Content, Determines Disruption. A.M. Surprenant, The Effect of Noise on Memory for Spoken Syllables. N. Caza, S. Belleville, Semantic Contribution to Immediate Serial Recall Using An Unlimited Set of Items: Evidence for a Multi-level Capacity View of Short-term Memory. N. Martin, E.M. Saffran, Effects of Word Processing and Short-term Memory Deficits on Verbal Learning: Evidence from Aphasis. J. Sait-Aubin, M. Poirier, The Influence of Long-term Memory Factors on Immediate Serial Recall: An Item and Order Analysis. N. Cowan, J.S. Saults, L.D. Nugent, E.M. Elliott, The Microanalysis of Memory Span and its Development in Childhood. J.A. Groeger, D. Field, S.M. Hammond, Measuring Memory Span. A.-M. Adams, L. Bourke, C. Willis, Working Memory and Spoken Language Comprehension in Young Children. Y.M.L. Chuah, M.T. Maybery, Verbal and Spatial Short-term Memory: Two Sources of Developmental Evidence Consistent with Common Underlying Processes. S. E. Gathercole, S.J. Pickering, Estimating the Capacity of Phonological Short-term Memory. E.V. Masoura, S.G. Gathercole, Phonological Short-term Memory and Foreign Language Learning. G.D.A. Brown, J.I. Vousden, T. McCormack, C. Hulme, The Development of Memory for Serial Order: A Temporal-contextual Distinctiveness Model. R.N.A, Henson, Coding Position in Short-term Memory. I. Neath, Modelling The Disruptive Effects of Irrelevant Speech on Order Information. D. Laming, Testing the Idea of Distinct Storage Mechanisms in Memory. B. Murdock, Item and Associative Interactions in Short-term Memory: Multiple Memory Systems? S. Lewandowsky, Redintegration and Response Suppression in Serial Recall: A Dynamic Newtwork Model. R. Schweickert, S. Chen, M. Poirier, Redintegration and the Useful Lifetime of the Verbal Memory Representation. M. Duncan, The Dimensionality of Memory trength Between Levels of Both Serial Position and Word Frequency Category. S. Sikström, Power Function Forgetting Curves as an Emergent Property of Biologically Plausible Neural Network Models. Subject Index.